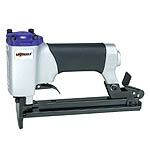 Spotnails 1/2-inch pneumatic staple gun 20 Gauge. Uses 80 series Staples: from 1/8" (3mm) to 9/16" (14mm) in Length; Spotnails 98000, FASCO EB-80 series staples. For upholstery, roofing felt, screening and other applications.